I know option o comes out to ø? So I have been using that as my theta. 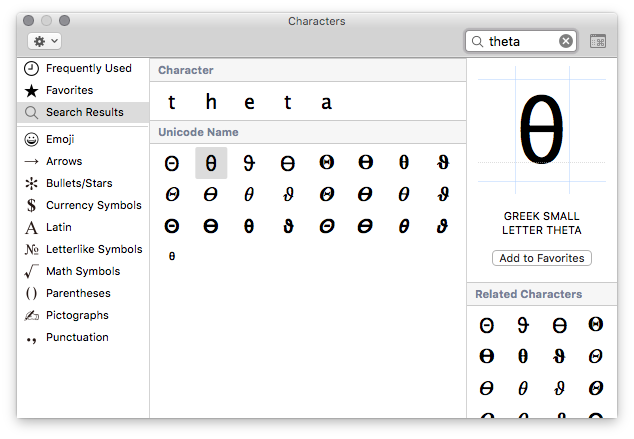 But I would love to know how to type Theta for a mac? Γο το Συστεμ Πρεφερενψεσ/Λανγθαγε & Τεχτ/Ινπθτ Σοθρψεσ, σεαρψη φορ Γρεεκ, αδδ ιτ. Νος υοθ μαυ τυπε θ φρομ κευβοαρδ. 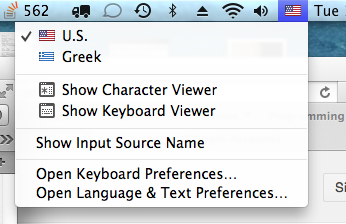 Go to System Preferences/Language & Text/Input Sources, search for Greek, add it. Now you may type u from keyboard. Or you may just use Find and replace function in Edit menu to change ø to θ afterwards. It looks like no one has mentioned the Special Characters window. Press Command ⌘+Control ⌃+Space to bring up the Special Characters window. Type theta into the search bar. As pointed out in this post, you can add keys to the press and hold key feature. By default, there is "no Roman-Accent-t" section, I coppied mine from "Roman-Accent-s." You could add θ to any key you like (e.g: "o") by modifying the appropriate section. Note: Case sensitive. "Roman-Accent-T" is NOT the same as "Roman-Accent-t"
Caution: This is a system-wide change. Edit carefully or make backups. Then click θ or press 1 to have a "θ" inserted into your document. I did not have to relog after making edits. System Preferences > Language and Text > Input Sources. Scroll down and enable Greek (or Greek Polytonic). Check Show Input menu in menu bar. When you want to type a θ (theta), switch the menu item to greek. Type u or U. Change back to your original language. In System Preferences, select Keyboard, then again select Keyboard, check the "Show Keyboard and Character Viewer in menu bar" option. Use the drop-down menu from the menu bar and select Show Character Viewer - there will be a short list that Apple thinks we will use. In the upper-left-hand corner there is a sprocket with a drop-down menu: select Customize List. Scroll down to European Alphabetic Scripts, click the arrow down to open that list, select the Greek check box, then choose Done. Greek will now be displayed in the list on the left. Select Greek in the list, highlight the theta character in the center, choose your variation, then scroll down and you will find Font Variations of the selected character. After you have decided which variation you would like to use click Add To Favorites. A new list name will show up under Recently Used called Favorites. When this is selected it will only show the favorites you have added. If you are using Lion or Mountain Lion then just press and hold the 'o' key and a list of o's with accents will appear with a number underneath. Then just type the number for the character you want or click on it. Just like the iPhone works. This does not work on OS X 10.11 without disabling SIP as the System Library is now restricted from modifications - even as root. 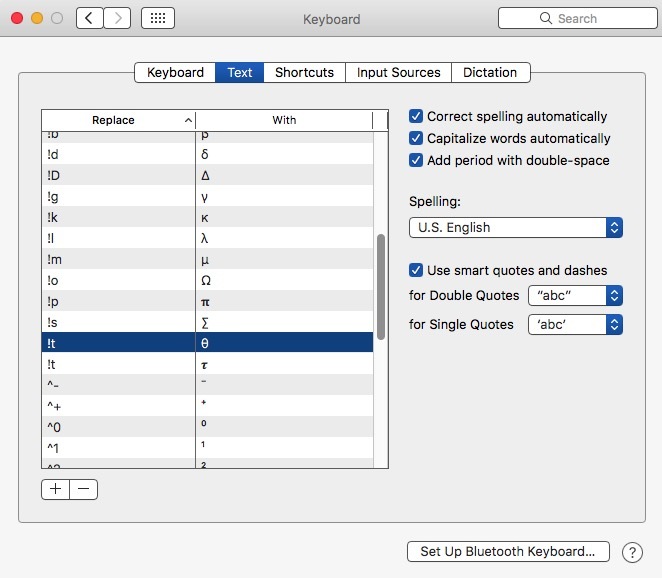 You can achieve this another way: You can add your own substitutions using Apple's symbol and text substitution in the text tab of Language and Text of System Preferences. I found it very simple and straightforward. Just as a test, I chose to substitute "o-" with "θ". You can use anything you want to substitute with anything you want. It's the same system that substitutes a typed 1/2 for ½. If you are using Microsoft word you can use auto correct to make the ø symbol into the theta symbol. using the toolbar at the top of your screen click 'insert' and then 'symbol' proceed to select the symbol that you want and then click 'AutoCorrect...' and you can make Word automatically change ø to theta. 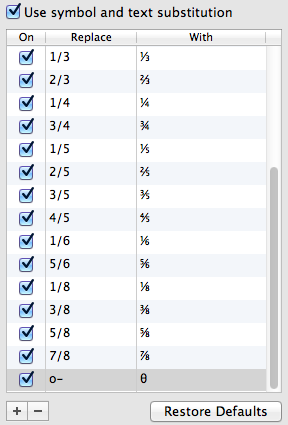 in ms word, go to word preferences then equations then math autocorrect. There will be a list of recognized functions and the key combinations for lots of different symbols. At the top of the screen there is an option to use math autocorrect rules outside of math regions, select this. I do a LOT of math answers online such as Yahoo!Answers where I have to enter both Greek letters like θ, but also 𝛑, √, ±, ≥, ℉, superscripts x² and subscripts H₂O, etc. I use Keyboard and Emoji viewer in the Menu bar. The setup is: System Preferences, Keyboard, check the box "Show keyboard and emoji viewers in menu bar. To use, click on the icon, select 'show Emoji and Symbols'. Select Greek and theta for θ. I put those I use a lot into my '★ Favorites'. I leave the Character box 'up and showing' so I can select symbols immediately. Technique 1 above works EVERYWHERE, including in Word. The second way is to use the Mac built-in text substitutions. Again in System Preferences, Keyboard, select the text tab. I have entered all the Greek letters such as '!a' (which is exclamation a) for α, and '!t' (exclamation t) for Greek Theta θ. As I type (in most programs) it immediately substitutes one for the other. Does not work in Word. In conclusion, I prefer the text substitution method (if it works). I even put in my name as ',j' and it types in my name Jim, email as ',e', ',p' for phone number, etc. but use what makes sense to you. BUT, it doesn't work everywhere, for those apps & programs I use the Symbol Viewer. If ANYONE wants my Keyboard Text Substitution.plist, let me know. You simply drop it into the Keyboard Text area and it adds mine to your list. If you enter a bunch of Keyboard Text Substitutions, SAVE THEM. It's very very easy! Do a 'Command A' to select them all, then drag the selection to the desktop. It will make a plist file!!! A LOT of people have issues retaining the Text list, so save it after any changes. Ι use command and v on the keyboard. Sorry this is so late. I'm not sure how much help it will be. Not the answer you're looking for? 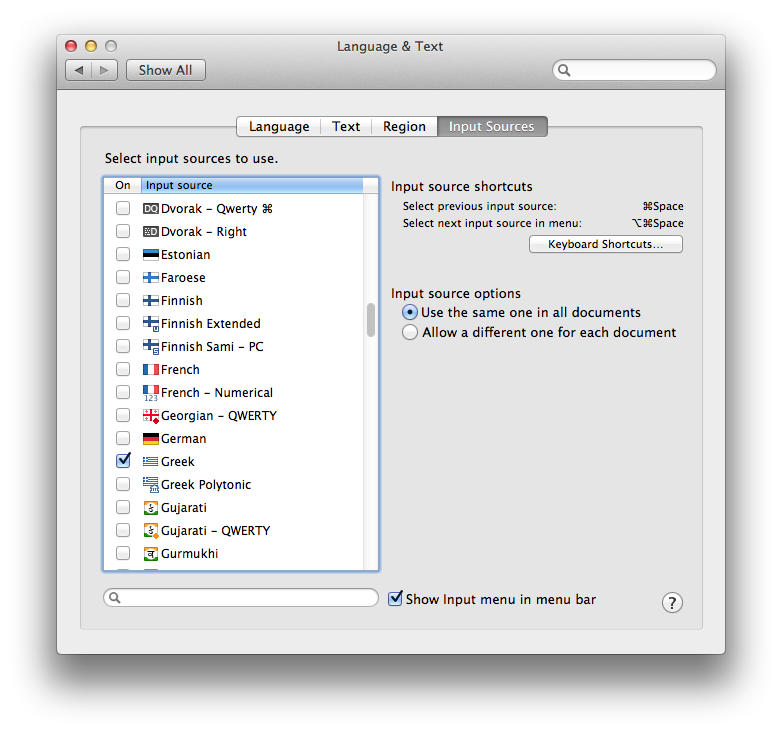 Browse other questions tagged macos keyboard internationalization . How can I use a custom .klc Microsoft keyboard configuration file on macOS? How to type in the redundant symbols in Simplified Chinese keyboard layout on MacBook?